Over-seeding of bowling greens seems like a straight-forward task; you put the seed on and the green’s bare areas recover. However, one of our regular readers has raised an interesting question today about over-seeding and it is by no means isolated. After over-seeding the green, the seed has taken well on the parts of the green that least needed it and nothing has happened on the barest areas of the green where the new grass is most needed! 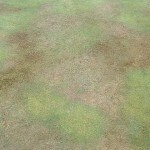 This is unfortunately a very common problem and is usually related to our old friend Localised Dry Patch (LDP). 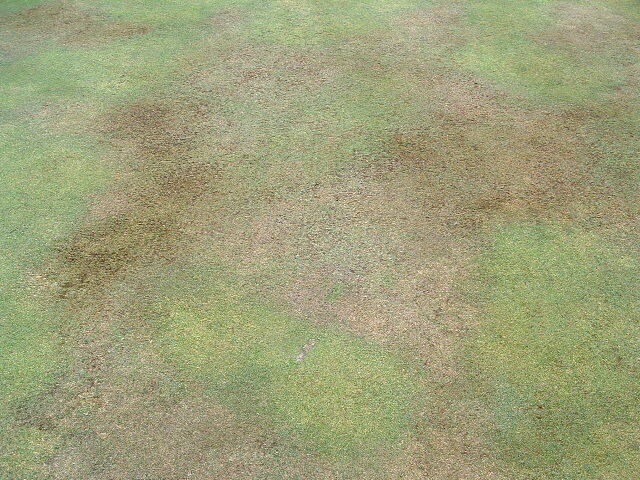 The barest areas of the green going into the autumn are usually the spots that have been affected by LDP and as such are bare due to lack of soil moisture. This means that quite a lot of preparation is required before seeding and this might even include heavy watering to get the soil to hold enough moisture to get the seed off to a good start. It might be necessary to do some light cultivation with a Sarrell roller or hand cultivator and, if the underlying soil is still dry and water repellent, a wetting agent would also help. The main problem is that we are now a bit late for further seeding, although this largely depends on the weather and temperature. I have seeded successfully up to Christmas in the past, but success with this is obviously dependent on the remainder of the winter. Certainly if we were to get another one like last year, even early seedings will struggle to survive the winter. If anybody is still having trouble getting grass cover on the green after overseeding please feel free to contribute ideas, tips or questions to the site. Irrigation, how much is enough?